Collective projects and collaborations characterised the second wave of modernism in Europe. Dada, surrealism, constructivism and other international styles emphasised and exploited the creative affinity and social conscience of artists. In this humorous poster Kurt Schwitters, the famed pioneer of collage, teamed with the Dutch-born Theo Doesburg to advertise a Dada performance, and turn typography on its head. The resulting image is at once striking, confusing, intriguing and attractive. Despite its strategies of inversion and miscalculation, the obligation of conveying useful information to the viewer has been fulfilled. In struggling to decipher the text one is brought closer to the poster, both physically and in terms of its content. This perceptual strategy is a hallmark of Dada, a move-ment with close links to cabaret, theatre and performance. 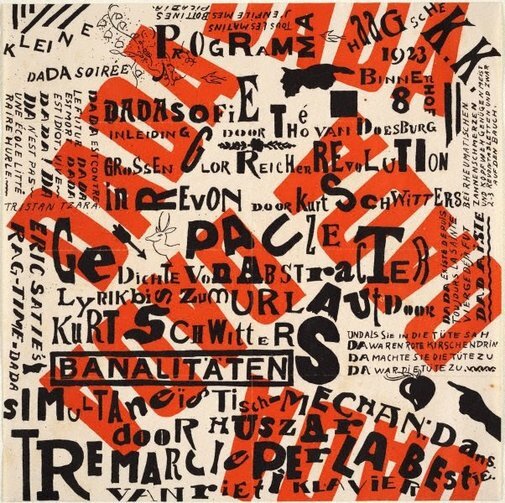 'Kleine DADA Soirée' would not look out of place in a contemporary cultural context; indeed the Dadaist heritage of artists such as Schwitters resurfaces in graphic conventions from pop art to punk rock. Signed and dated c. image / sheet [inscribed on plate] "...1923...Théo van Doesburg...Kurt Schwitters...". Renée Free, AGNSW Collections , 'The Western Heritage, Renaissance to Twentieth Century', pg. 108-172, Sydney, 1994, 151 (colour illus.). Bruce James, Art Gallery of New South Wales handbook , 'Western Collection: Works on Paper', pg. 78-92, Sydney, 1999, 90 (colour illus. ).